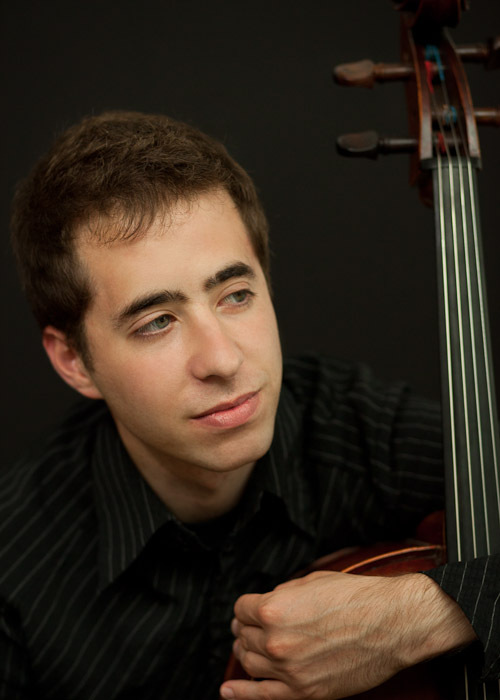 The talent of young cellist Matthew Zalkind, who performed a recital on June 29 at Libby Gardner Concert Hall as part of the University of Utah School of Music’s eighth Summer Chamber Music Workshop, comes from equal parts nature and nurture. His father, Larry Zalkind, retired from his position as Principal Trombonist at the end of the 2014-2015 Utah Symphony season to take a teaching position with the Eastman School of Music; his mother has been the Associate Principal Violist of the Utah Symphony for many years now. Matthew was, for a number of years, a member of the Harlem String Quartet, studied at the Juilliard School and the University of Michigan, and has recently assumed a position as Assistant Professor of Cello at the University of Denver in Colorado. His cello tone is a full one, tempered with warmth and precision of phrasing. The June 29th program embraced a range of composers, from the late Renaissance / Baroque and Romantic eras, plus that pinnacle for some listeners, a composition by a living composer. The concert began with a fiery rendition of Girolamo Frescobaldi’s (1583-1643) “Toccata for Cello and Piano,” arranged – although there is apparently evidence that he actually composed it — by Gaspar Cassado, a superb and famous Spanish cellist of the first half of the 20th century. Zalkind played his part from memory, his tone emitting a dark-hued brightness as he unfurled an elegantly unwinding lyricism and spinning lyric fervor in a piece that is about 4 1/2 minutes in length. Jason Hardink (Utah Symphony’s Principal Keyboard) was the accompanist, with balances that more or less reigned smoothly. Giovanni Sollima’s “Lamentatio” (completed 1998) for solo cello was a dramatic change of style, atmosphere, and mood. Sollima (b.1962) is an Italian composer and cellist, and “Lamentatio” is about 5 ½ minutes in length. At times, almost schizophrenic in its agitated high cello lines, its intensity of line and color surged and, here and there, almost burst the expected lyrical boundaries. Pulsating tones in both the high and low register, as well as pizzicato were prevalent at times. Zalkind again worked with no written or digital score. At times Zalkind was singing vocally, almost certainly as the score indicates, his cello tone became more brightly lit. This was a most convincing performance of a piece that is clearly quite difficult to perform successfully. Ludwig van Beethoven’s “Sonata for Cello and Piano in A major, Op.69” (his Cello Sonata No.3, completed in 1808) was performed just before intermission. Beethoven composed five sonatas for cello and piano, and while they are not the most important part of his output, they are nevertheless charming and wittily pensive by turns — they more than earn their place in the standard repertoire of cello sonatas. Zalkind and Hardink’s interpretation of the first movement, an Allegro ma non tanto, was fully formed and thoroughly inhabited with emotion and whimsy. There was a felt-like cushion of warmth in cello and piano tones and texturing, with a supple, at times, placid poise. Hints of the rugged in the more or less seamless phrasing — apt for Beethoven — devolved into an urgency that was served when needed. The lyric and rhythmic pulses were suffused with fragrant energy, with a rippling clarity to the balances toward the very end in soft dynamics. The agile energy of the second movement, Scherzo. Allegro molto, was slyly, even wittily ferreted out and applied in effortless doses to the lyrical and rhythmic horizon. A gallant interweaving of rhythms and textures ended with a pulse buoyantly quick and light in cello and piano. In the third and final movement, Adagio cantabile — Allegro vivace, the Adagio possessed a seriousness in its phrasing, but was never too heavy. The quicksilver mood at the start of the Allegro was caught with aplomb: the bursts of extroverted lyricism took flight in both cello and piano, but both players were able to relax back naturally in the less urgent moments. With an earthy plangency to cello colors and tone, balanced by more deftly calculated pianism, it was an open-hearted and rousing race to the finish. German composer Johannes Brahms (1833-1897) composed approximately 24 masterpieces in the chamber music genre, and his “Piano Quartet in C minor, Op.60” (completed in 1875) is an exemplary example. For this composition, Hasse Borup on violin and Roberta Zalkind on viola joined Matthew Zalkind and Jason Hardink. The first movement, an Allegro non troppo, is the longest, and here the dark amber to the embers of passion in the introduction’s textures require and received attention from the first spark. The shifts to more reflective sections were like pointillism in painting in their luxurious phrasing and textures. A viola solo — floated in supple but resolute fashion by Roberta Zalkind — with piano evoked a distant caution in the phrasing, and the forlorn mood at the very end was found squarely by all four players. A Scherzo Allegro, the second movement was lithe, with a hint of appropriate agitation. Compared to the first movement, the four players found a unified urgency of tone. The suavely nimble resonance of rhythms was guided skillfully by pianist Hardink — one of his hallmarks. The third movement, an Andante, only has the cello and piano playing at the beginning. This playing was the most naturally synchronized so far in the performance. When the violin entered, its somewhat smaller, brighter tone did not exactly engender the most unified of moody moments with the cello. Eventually, the entire ensemble finally settled into a lyrical groove of sorts. Hardink provided some captivating ruminative passages, almost as in a separate, distantly joined world. Finale. Allegro comodo, the last movement, has violin and piano play alone to start. Hardink’s alternately submerging and surfacing lines were ever present and balanced best, with Borup’s tone apparently seeking its own reverie. The ensemble finally engaged in some rhythmic sway with more meaning and passion, and this movement received the most unified treatment of the four by the musicians. This recital, which really was a generous one in its outpouring of emotional honesty, at times lacked a more unified sense of a journey, especially in what was perhaps the centerpiece — at least in terms of length — the “Piano Quartet in C minor” by Brahms, which officially ended the listed program. As the four movements progressed in this rather tragic work, the sense of striving for and attaining more of a unity of emotions became discretely more pronounced, but for this listener at least it did not quite settle into place. In a sense the lines came together more as solo entities, and they created their own sense of enthusiasm and ardor, so that the Brahms appeared a rather unsettled interpretation, perhaps reflecting the heart of the music itself. There was an encore, but just for cello and piano. Mr. Zalkind announced it from the stage, mentioning that the performers did not want to leave the audience (of about 100 people) with such a tragic ending — the last movement of the just-finished Brahms piano quartet. The encore was the second movement of German composer Robert Schumann’s 5 Stücke in Volkston, Op.102. This second piece (completed in 1849) is marked Langsam (Slow), and lasts about 3 1/4 minutes. Zalkind and Hardink began with a calibrated warmth of tone and phrasing, but then jettisoned this for a more carefree endeavor — with the Beethoven, the most delightful performance of the evening. The Artist-Residence recital of the Summer Chamber Music Workshop is a bit hidden at the start of the summer concert season, but it is well worth attending. Matthew Zalkind is a passionate and exceptionally skilled and gifted cellist, his cello tone firmly, cleanly, and sweetly projected. This recital again demonstrated pianist Jason Hardink’s talent and ability to merge, as required, into the foreground or background of compositions from different eras and with varying styles. As local classical music enthusiasts know, since 2009 he also has been artistic director of the NOVA Chamber Music Series, which he has imbued with renewed enthusiasm in its ever more adventuresome programming. In the two pieces that both of these musicians played together, and at times in the Brahms, their mixture of energy and finely detailed reticence often found the center of the work’s atmosphere, moods, and emotions. We should hear them again sometime in the near future, perhaps in Richard Strauss’s early Sonata for Cello and Piano, or the Romanian composer George Enescu’s two cello sonatas.